The following ad examples are designed to help you establish the right usage, size and placement for both GuildQuality identity and language. 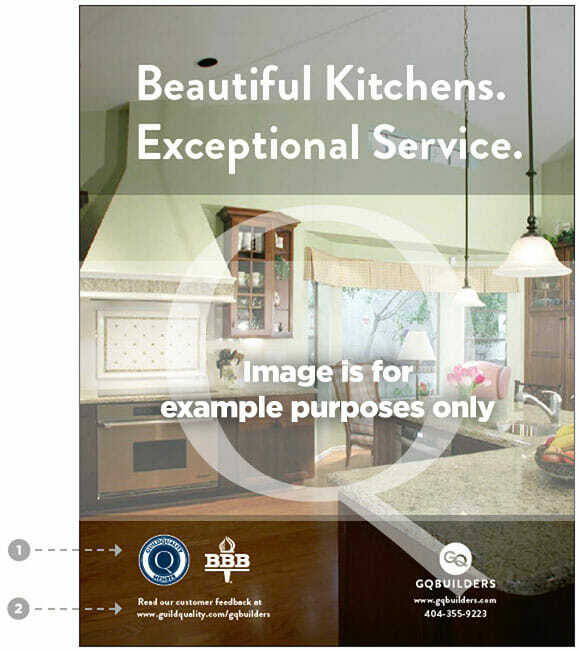 In this ad, the GuildQuality Member badge is scaled proportionally and demonstrates enough clear space between other emblems. Below, the member has included a reference and link to their GuildQuality profile page. 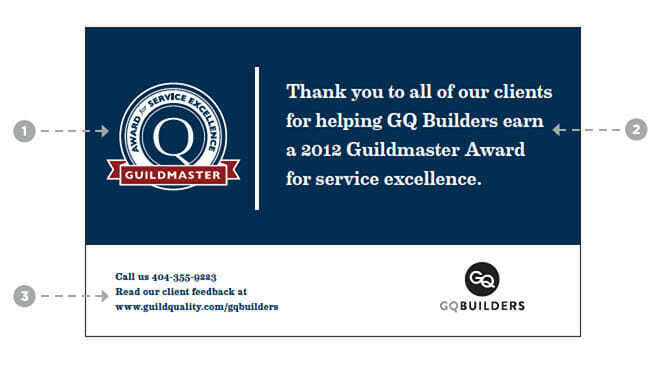 In this ad, GQ Builders proudly displays their Guildmaster badge. It is scaled proportionally and demonstrates enough clear space between other emblems. The copy of the ad also references service excellence, a key component of GuildQuality membership and the Guildmaster distinction. Below, they reference a link to their GuildQuality profile page. 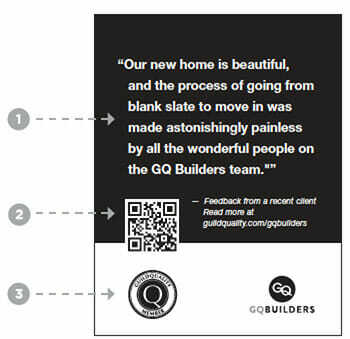 In this ad, GQ Builders displays customer feedback from their profile page. They’ve also used a QR code to link their GuildQuality profile page. The GuildQuality Member badge is scaled proportionally and demonstrates enough clear space between other emblems. 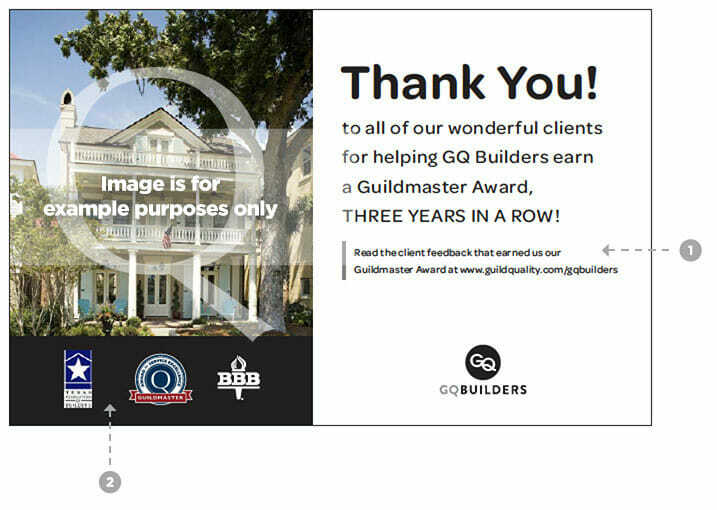 GQ Builders correctly references a link to their GuildQuality profile page. The Guildmaster badge is scaled proportionally and demonstrates enough clear space between other emblems. 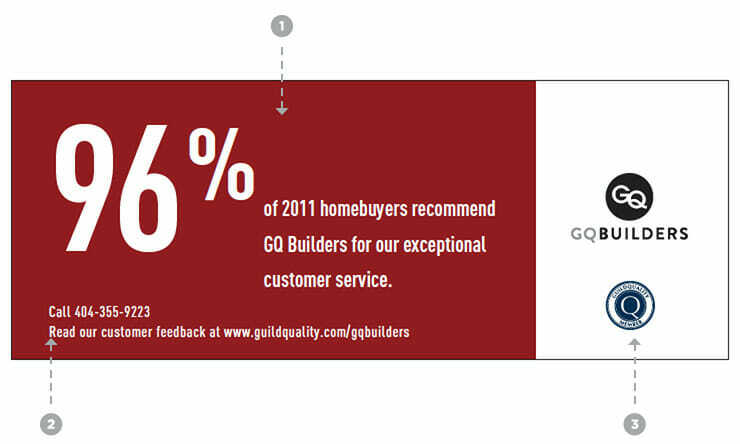 In this ad, GQ Builders displays a customer satisfaction rating of services from their GuildQuality profile. The GuildQuality Member badge is scaled proportionally, and demonstrates enough clear space between other emblems.